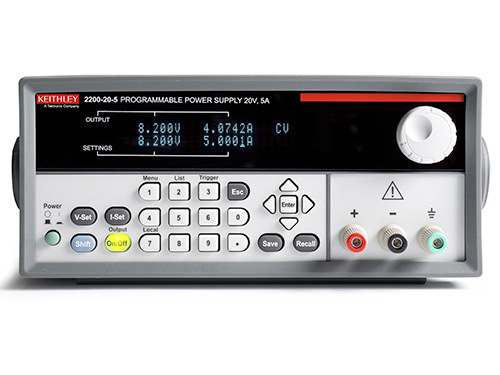 0.05% basic current setting and readback accuracy Ensures high quality load current measurements. 0.1mA current resolution Allows measuring idle and sleep mode currents for verifying that products meet aggressive low power consumption goals. Dual-line display Shows both the programmed values and actual outputs for a continuous indication of the status of the power delivered to the load. Built-in List mode Simplifies creating repeatable test sequences of up to 80 output steps. Programmable overvoltage protection Causes the output to drop below 1V if the overvoltage limit is reached. Front panel lock-out functions Ensures that test parameters are not accidentally changed. GPIB and USB interfaces Simplifies integration into automated test environments. Learn about the five different models in the Series 2200 Power Supplies. This document contains specifications for the Models 2200-20-5, 2200-30-5, 2200-32-3, 2200-60-2, and 2200-72-1 Programmable DC Power Supplies.